Sharon Waxman, CEO of TheWrap, and Adrienne K. Elrod, Director of Strategic Communications & Surrogates, Hillary for America, speak on a panel during the TheWrap's Power Women Breakfast on March 10, 2016 in Washington, D.C. The crowd attending TheWrap's Power Women Breakfast in Washington, D.C., on March 10. Maureen Dowd, a New York Times columnist, speaks during the TheWrap's Power Women Breakfast in Washington, D.C.
Ruth Vitale, CEO of CreativeFuture, speaks on a panel during the TheWrap's Power Women Breakfast in Washington, D.C.
Jessica Rosenworcel, Commissioner of the FCC, speaks on a panel during the TheWrap's Power Women Breakfast in Washington, D.C.
Karen Appleton, Senior VP of BOX, Ruth Vitale, CEO of CreativeFuture, Jessica Rosenworcel, Commissioner of the FCC, and Julie Brill, Commissioner of the FTC, speak with Sharon Waxman on a panel during the TheWrap's Power Women Breakfast in Washington, D.C.
Karen Appleton, Senior VP of BOX attends the TheWrap's Power Women Breakfast in Washington, D.C. Senator Amy Klobuchar speaks during the TheWrap's Power Women Breakfast in Washington, D.C. on March 10. Lezlee Westine, Personal Care Products Council, speaks at TheWrap's Power Women Breakfast in Washington, D.C.
A shot of the crowd attending TheWrap's Power Women Breakfast in Washington, D.C., on March 10. TheWrap's CEO Sharon Waxman speaks to Rep. Debbie Dingell (D - Mich.) at TheWrap's Power Women Breakfast in Washington, D.C.
Julie Brill, Commissioner of the FTC, speaks to the women attending TheWrap's Power Women Breakfast on March 10. TheWrap's CEO and Founder Sharon Waxman, with Sen. Amy Klobuchar at TheWrap's Power Women Breakfast on March 10. TheWrap's CEO Sharon Waxman with New York Times Washington bureau chief Elisabeth Bumiller, Creative Future CEO Ruth Vitale, BOX senior VP Karen Appleton, Adrienne K. Elrod, Heather Podesta and Lezlee Westine at TheWrap's Power Women Breakfast in Washington, D.C.
Karen Appleton, Senior VP of BOX, hugs another guest at TheWrap's Power Women Breakfast in Washington, D.C.
TheWrap's CEO Sharon Waxman speaks to a guest at TheWrap's Power Women Breakfast in Washington, D.C. on March 10. 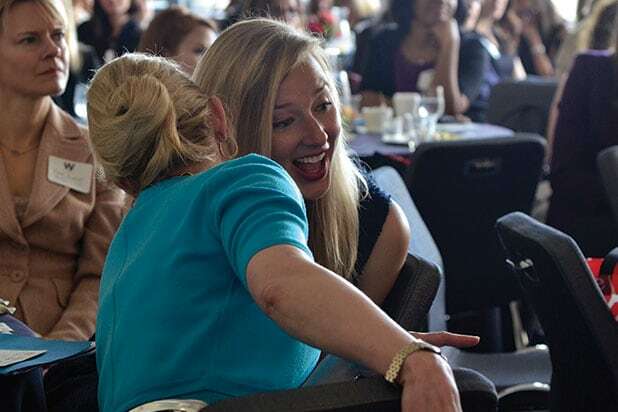 Rep. Debbie Dingell engages in conversation with other guests at TheWrap's Power Women Breakfast in Washington, D.C. on March 10. Karen Appleton, Senior VP of BOX, Ruth Vitale, CEO of CreativeFuture, Jessica Rosenworcel, Commissioner of the FCC, and Julie Brill, Commissioner of the FTC speak with Sharon Waxman on a panel during the TheWrap's Power Women Breakfast on March 10. 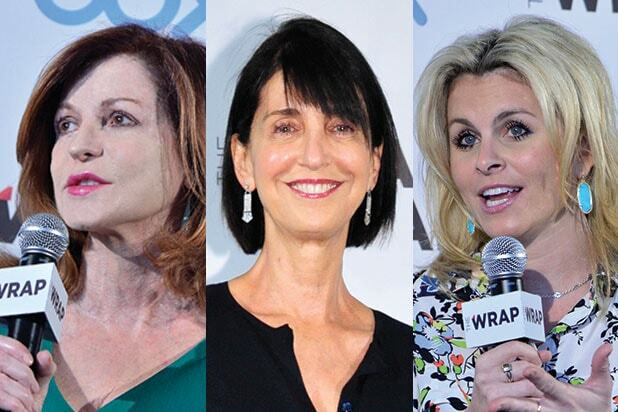 Guests attend TheWrap's Power Women Breakfast in Washington, D.C. on March 10. Table arrangement at TheWrap's Power Women Breakfast in Washington, D.C.
Karen Appleton, Senior VP of BOX attends the TheWrap's Power Women Breakfast in Washington, D.C. on March 10. Maureen Dowd, columnist of The New York Times, and Elisabeth Bumiller, Washington Bureau Chief of The New York Times, strike a pose during the TheWrap's Power Women Breakfast in Washington, D.C.
Adrienne K. Elrod, Director of Strategic Communications & Surrogates, Hillary For America, attends TheWrap's Power Women Breakfast in Washington, D.C. Senator Amy Klobuchar speaks during the TheWrap's Power Women Breakfast in Washington D.C. on March 10. Jessica Rosenworcel, Sharon Waxman and Julie Brill pose for a photo at TheWrap's Power Women Breakfast in Washington, D.C.
Karen Appleton greets other guests at TheWrap's Power Women Breakfast in Washington, D.C.
Rep. Debbie Dingell meets other guests at TheWrap's Power Women Breakfast in Washington, D.C.